arimasu and imasu - How to express Existence in Japanese? 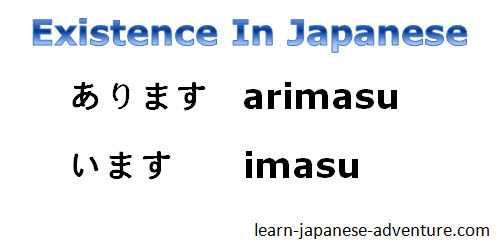 arimasu and imasu are 2 Japanese verbs used to express existence of thing and people/animal respectively. あります (arimasu) is used when what is present does not move by itself, like thing or plant. On the other hand います (imasu) is used when what is present moves by himself/itself, like people or animal. Meaning: There is a desk. Meaning: There is a tree. Meaning: There is a boy. Meaning: There is a cat. 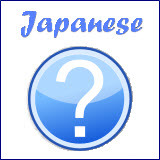 To indicate the place where the subject is present, use the particle に (ni). Meaning: There is a desk in the room. Meaning: There is a tree in the park. Meaning: Teacher is in the classroom. Meaning: A cat is in the kitchen. 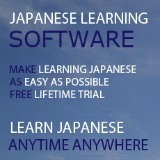 In lesson 3 on Japanese noun part 2 I have mentioned that you can use one noun to modify another noun. One of the meanings is to describe the location. I will give more examples on the above so that we can use the location in the existence sentence structure. Meaning: There is an apple on the desk. Meaning: There is a school behind the park. How to Ask Who or What Exists in the Place? Question: Who is in the meeting room? Answer: Mr Tanaka is in the meeting room. Question: What is below the chair? Answer: A cat is below the chair. Question: What is inside the box? Answer: An apple is inside the box. How to Answer Yes/No Questions? 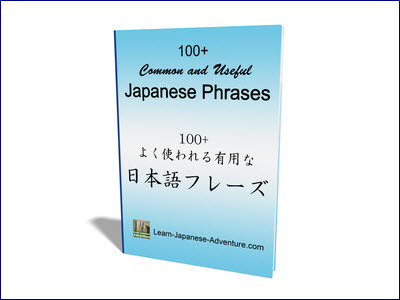 Generally, particle は is used for negative sentences. Question: Is there flower in the park? Answer: Yes, there is flower. Answer: No, there is no flower. How to Say Nothing/No One Exists? Meaning: Person is in the Place. Meaning: Thing is in the Place. Meaning: Where is the Person? Meaning: Where is the thing? Question: Where is Mr Yamada? Answer: Mr Yamada is in the classroom. Question: Where is the book? Answer: The book is on the desk.